A pilot project undertaken between Saint Petersburg State Paediatric Medical University (SPSPMU) and Delcam in 2012 showed that custom orthotic insoles made with OrthoModel design software can be used not only to correct disorders of patients’ feet but also to improve children’s posture. The research, which was carried out on three patients, was undertaken under the supervision of the Chief Doctor of the CDC, Head of Exercise Therapy, Physiotherapy and Sports Healthcare Department of SPSPMU, Dr. A.A. Gaiduk. Each patient suffered problems associated with a skewed pelvis, which caused a shift in total body weight in the coronal plane and, consequently, foot overloads on the side of the pelvis skew. For the project, a complete set of equipment and software for the design and manufacture of custom orthopaedic insoles, including an iQube scanner and OrthoMODEL design software and the OrthoMILL machining system. Initial tests on the patients were conducted using the FAMUS DIERS diagnosis system. This has been used by orthopaedists at SPSPMU to detect postural disorders, and to obtain digital and graphical data for diagnosis and selection of relevant treatments since 2010. It includes a body-surface scanner which analyses the whole back based on approximately 10,000 3D measured points. The results allow the user to detect even minor changes in the patient’s posture, e.g. after exercise therapy or manual therapy, or after a significant time interval in any period of growth spurts. They provide reliable data about both the state of the spine and postural changes in patients in the course of their treatment. The patients’ feet were then scanned using the OrthoConcept scanner to obtain an accurate 3D digital model of the feet. Data from both devices was combined by the orthopaedist to design the insoles within OrthoMODEL. This allowed consideration of the individual features of each patient, including compensation for differences in the height of the feet and the placement of correcting add-ons, such as metatarsal pads. 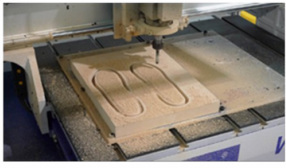 Toolpaths for the milling machine were generated in OrthoMILL to manufacture the insoles. The patients were also prescribed manual methods of corrective therapy and individual exercise programs. The full set of tests was repeated on the three patients after they had been fitted with the insoles. The results showed significant improvement of their biomechanical poses and the state of their postures since they had been using the insoles. Thus, the results of the pilot project showed that the use of the 3D Ortho scanner and software, together with FAMUS DIERS instrumental examination, provides not only for objective diagnosis but also allows the production of height-compensating orthotics for effective remedial treatment of children and teenagers with functional diseases of the loco-motor system.